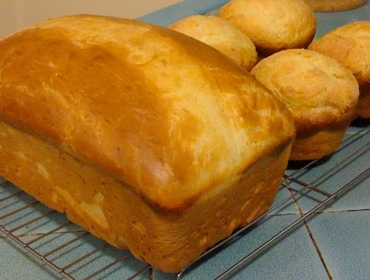 It’d been nearly a decade since I’ve felt confident about making Sally Lunn bread again. The last time I tried to bake it, about a couple of years ago, it was dense and unpleasantly over-yeasty. I thought I had lost my touch. Then I decided to weigh out the flour, review Marion Cunningham’s Sally Lunn recipe from The Fanny Farmer Baking Book , as well as mull over Shirley O. Corriher’s two brioche recipes in Cookwise . I’m not sure if adding a sponging stage and using bread flour helped, but the resulting bread was rich with a delicate crumb. For me this bread is basically an easier, lighter (somewhat) version of brioche. Not just less butter, but melted butter which in a snap can be mixed in. Then again, as I had mentioned in version 1.0 of this recipe, the Sally Lunn bun seems to be an English version of brioche anyhow. Yeah, the ingredients and method are remarkably similar to version 1.0, but I added more details which I think will make the recipe more dependable. Version 2.0 makes enough for 1 hefty loaf (9x5x2-inch pan) plus 4 muffin-sized buns (4-inch diameter cups). If your kitchen is cold, or unheated in winter like mine, preheat oven to its lowest temperature setting. For example, my oven goes as low as 170ºF degrees. You can skip this step if your kitchen is comfortably warm, i.e., 70ºF or more. In the mixer bowl, weigh out 10 ounces of the flour. To that stir in the yeast, 1 teaspoon of sugar and 1/2 teaspoon of salt. Stir in 1 more teaspoon of sugar into the warmed milk, then pour that into the flour mixture in the previous step. Stir well so that all the flour is coated — this is your sponge, so let that sit, covered, for 30 minutes. A few bubbles should form during the sponging period, showing that the yeast is alive. In the meantime, combine the rest of the flour, sugar and salt in another, smaller bowl, and set aside. Now is also a good time to melt the butter, and bring the eggs to room temperature. A good way to prepare the eggs is to put them in a bowl of warm water (approximately body temperature, not much hotter) for 5 to 10 minutes. Turn off the oven, if you had it on in step 1. When the sponging step is done, mix in the eggs, one at a time, making sure the dough is smooth after each egg. I use the paddle attachment for the mixer here, with the mixer at medium speed. Mix in about half of the remaining flour mixture. Next, slowly pour in the butter, alternating with the rest of the flour, still making sure that the ingredients are incorporated into a smooth dough. The end result should be a very sticky, soft dough. You could also add a bit more flour if it looks too liquidy. Cover the bowl and allow the dough to rise in a warm place (oven or room) until doubled in bulk. This could take from 2 to 3 hours. The eggs, butter and sugar slow things down, so have patience! Stir down the dough, and let it rest for about 15 minutes. In the meantime, generously grease the pans with softened butter. Glop the dough into your pans; a greased spoon or rigid spatula helps here. For a muffin pan, fill each cup less than half full, roughly 35% to 45%ish. For the bread pan, the dough should fill it over halfway, roughly 55% to 65%ish. Attempt to smoothen the tops (again, applying a greased spoon or finger), but don’t worry about getting them perfectly smooth or even. Cover the pans, set aside in a warm place, and let ’em double in bulk yet again (last time!). This should take about 1 1/4 to 2 hours; you’ll need to remove the coverings about halfway, since the dough should rise above the pans’ rims. Remember to remove the pans if they were sitting there during the final rising — and preheat the oven to 400ºF degrees. Slash the loaf with sharp but greased (or wet) blade, so that it can expand during baking. Mix sugar, if desired, with the extra warmed milk. Glaze the loaf and buns, taking care to avoid deflating them — brushing upwards towards the center helps. Sprinkle with a little bit more sugar, if you want. Pop both buns and loaf into the oven. After the first 10 to 15 minutes, lower the temperature to 375ºF and rotate the muffin pan 180-degrees. After another 8 to 10 minutes, the muffins should be done (remove them). Give the loaf a turn at this time as well. The loaf should be done in another 8 to 10 minutes. Total baking times: 20 to 25 minutes for the buns, 27 to 31 minutes for the loaf. Remove the breads from their pans as soon as you take them out of the oven. Allow to cool on a rack for about 20 to 30 minutes before serving. As with v1.0, v2.0 is splendid with butter, clotted cream, jam, lemon curd, and/or honey. And perfect for tea. This was written by sairuh. Posted on Friday, December 26, 2008, at 12:10 pm. Filed under Food. Tagged bread, recipe. Bookmark the permalink. Follow comments here with the RSS feed. Post a comment or leave a trackback.